DICE's Karl-Magnus Troedsson may want to go poaching. Last week EA signed an exclusive Star Wars game deal with Disney, and now it has opened a new DICE studio in Los Angeles, with the sole purpose of making Star Wars universe titles. DICE's Karl-Magnus Troedsson, in a Wall Street Journal article, confirmed that the studio intends to have 60 staff by the end of the year. This new DICE is a satellite of the Swedish operation, and is looking for vital staff - audio artists, world artists, level designers and the like - ASAP. Troedsson might already have his eye on one or two talents. 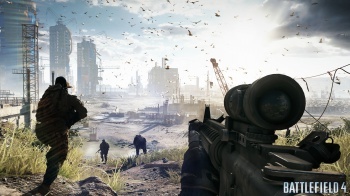 DICE is, after all, the maker of the Battlefield series, and the Call Of Duty developers - DICE's competition - also operate in sunny California. "There is an extreme talent pool over [there] that we want a part of," he told the Wall Street Journal. "It's no secret that our main competitor is there." DICE LA already has some staff on board, mainly EA talent with Medal of Honor credits, but DICE's jobs page lists a series of jobs open in California, for those who think their futures lie in a galaxy far, far away. For those of you wondering whether a specific Star Wars title is on the cards, Troedsson isn't about to confirm or deny any rumors. We'll just have to wait and see.